Colfax Avenue: Ever Wonder How The Tony Awards Got Its' Name? The prestigious Tony Awards honors theatre professionals for distinguished achievement on Broadway. Sponsored by the American Theatre Wing, the awards program debuted at a formal dinner with over 1,000 guests in the Grand Ballroom of the Waldorf Astoria in New York City on Easter Sunday, April 6, 1947. The big winners that night included José Ferrer, Arthur Miller, Helen Hayes, Ingrid Bergman, Patricia Neal, Elia Kazan and Agnes de Mille. But who the heck is Tony? Tony is none other than Denver’s own 1906 East High School graduate, Antoinette “Tony” Perry: actress, director, producer, community activist, humanitarian and the dynamic wartime leader of the American Theatre Wing, which she co-founded to realize her lifelong efforts to encourage young theatre talent. The official name of the award is the Antoinette Perry Award for Excellence in Theatre. 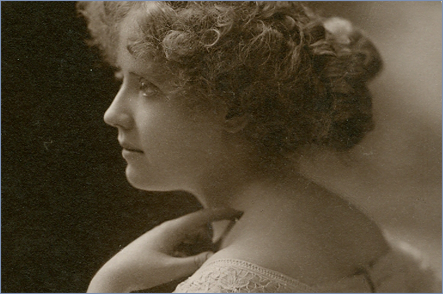 Born June 27, 1888 in Denver, Colorado, Antoinette Perry spent her childhood aspiring to become a thespian like her aunt and uncle who were both well-respected touring actors. As a teen, Antoinette joined their stock company billed as "the youngest female star in America" and enjoyed great success for many years. Miss Perry fell in love with and married utilities magnate (Denver Gas and Electric), Frank Frueauff in 1909, eventually leaving stage life and having two daughters, Elaine and Margaret. After Frank died in 1922 she returned to theatre, becoming the very first successful woman producer/director. Strictly Dishonorable, which opened in September 1929 and ran for 557 performances, was Perry’s first great success as a Broadway director. She produced and directed an epic run of hit shows (17 plays in 13 years), including Personal Appearance (1934), Kiss the Boys Goodbye (1938) and Mary Chase’s Pulitzer Prize- winning Harvey (1944). Antoinette made her mark unselfishly flinging open doors of opportunity for women in theatric arts. Her esteemed place in history was sealed by her tireless drive as an activist and humanitarian, often against impossible odds. The American Theatre Wing which she founded in 1939 with actresses Josephine Hull, Gertrude Lawrence and Helen Menken operated the famed Stage Door Canteen in the basement of the (now razed) 44th Street Theatre, where stars worked as dishwashers, servers, and entertainers providing relief to World War II armed forces members. The sale of film rights for a story about the canteen, a generous donation from Perry and additional financial support from Rodgers and Hammerstein, provided USO show tours to overseas troops. At the end of the war, Miss Perry was the guiding force in setting up a drama school for veterans under the 1944 GI Bill. Tony also coordinated 1,500 auditorium programs and 6,700 hospital entertainment units in the U.S. and abroad. To the great sadness of countless fans, Perry died from a heart attack on June 28, 1946, one day after her 58th birthday. She is buried at Woodlawn Cemetery in The Bronx, New York City. Antoinette Perry was an East High Angel in the truest sense.